← Evidence of the Existence of Satan? I am blessed with three siblings. We are all unified in our love for each other and diverse in our theology. We also agree that none of us has cornered the market on God’s Truth. 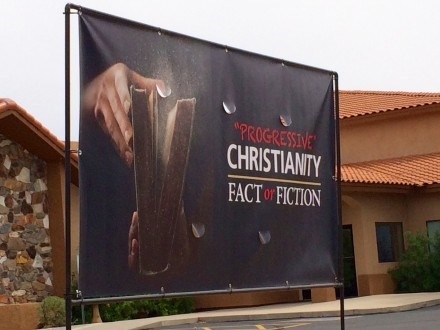 Eight Protestant pastors in Fountain Hills all agreed to preach a series of sermons called “Progressive Christianity: Fact or Fiction?” They penned a united op-ed for their local newspaper that you can read here. In my house, we do not mess with John Wooden. What is the difference between “Progressive” Christianity and Biblical Christianity? Does that difference really matter in a relativistic age? How can a Christian decipher what he or she should believe? I take the Bible so seriously that I want to dissect it, study under, over, around, and through it – preferably in the most original languages we have. I want to understand what it meant when it was written, when it was first read, and as we read it today for a 21st Century Church. Do I believe Mary was a virgin? Sure, but honestly, my faith doesn’t rise or fall on Mary’s virginity. If we found out conclusively somehow that she wasn’t a virgin, would we toss everything thing else? Do I believe that Jesus is The Only Way? Absolutely, but what does Jesus mean by “Way” here? (And don’t think for a second I’m pulling a Bill Clinton – “it depends on what the meaning of the word is is” – kind of verbal gymnastics.) Scripture speaks of people who speak all the right words but do not live the way of Jesus. God bless the Pharisees who believed they were following the right way only to miss the point completely. I know Muslim, Jewish, and Atheist friends who follow the way of Jesus quite closely. Do they call Jesus “Lord”? Nope. But I trust in a non-Pharisaical God. And it seems that this was the way of Jesus too. How do we discern what to believe? I suggest reading the Pentecost story very carefully this week. The Spirit continues to work and speak as it happened in Acts 10. God still has no partiality. God still calls us to move in directions that we once believed were unfaithful. God still sends us places we don’t necessarily want to go. I have brothers and sisters in Christ who interpret Scripture in a different way from how I interpret it. But note: we are all interpreting it. We all consider some verses more essential than others. Not one of us takes it literally, even when we say we do. Rachel Held Evans and A.J. Jacobs are required reading for those who believe it’s possible to take the Bible literally. God calls us to pray well with others. I believe in the Jesus who had dinner at the home of Zaccheaus the loathed tax collector even at the risk of offending the faithful. I believe in the Jesus who touched an unclean woman even though it would have rendered him unable to enter the temple. I believe in the Jesus who told parables that rocked everything believers had been taught. Helpful Samaritans? Really? It’s a particular congregation’s choice to worship in the way we will and believe what we do. But we are treading on dangerous cosmic ground if we expend our energies throwing theological stones. It’s the kind of action that sadly supports what too many people believe about the church.